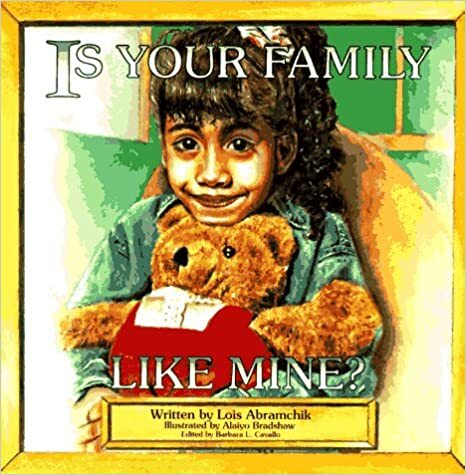 Written by Lois Abramchik, with realistic black and white charcoal illustrations by Alaiyo Bradshaw, Is Your Family Like Mine? (1993) is about a little girl named Armetha. After starting Kindergarten, Armetha grows self-conscious that she doesn’t have a father. She begins to ask her diverse classmates about their families and realizes that some have divorced parents and live with step-familes, some have single parents, some live in foster care, and some live with a mom and dad. All families are different, but the most important thing is that they are connected by love. Although Armetha accepts the lesson she learns from her friends, she asks her moms why she doesn’t have a daddy. They explain: “One kind of Daddy helps create babies and another kind helps raise them. You have the first kind of Daddy, who helped create you and you have two mommies who love you and will help you grow up.” Armetha is quite satisfied with this response. I appreciated the focus on diverse family forms that doesn’t get stuck in a heterosexual/homosexual binary but shows single-parent and foster families offering loving alternatives to the heteronormative nuclear arrangement. Published by Open Heart, Open Mind, the book is professionally written and illustrated, which is not always the case with small publishers. Although similar themes are explored in newer books, this does stand the test of time! It is a sweet story about family likely to prompt productive conversations if added to personal or classroom libraries.